Whether for education or as a hobby, chemistry is an interesting area of science involving many specialty tools. Chemistry flasks are very important tools that come in many shapes, sizes and accuracies of measurement. Each flask has a specific purpose, so it is important to know about each of the basic lab flask types. 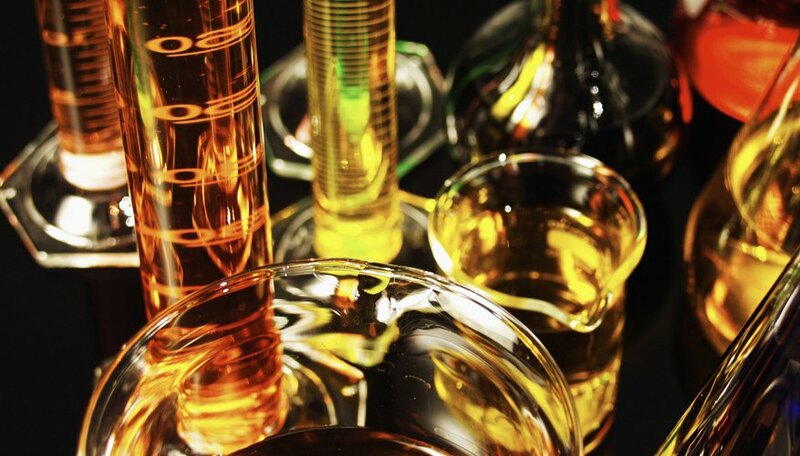 Most chemistry flasks are made of special glass that survives well when heated and does not leech minerals or chemicals into the solution stored within. 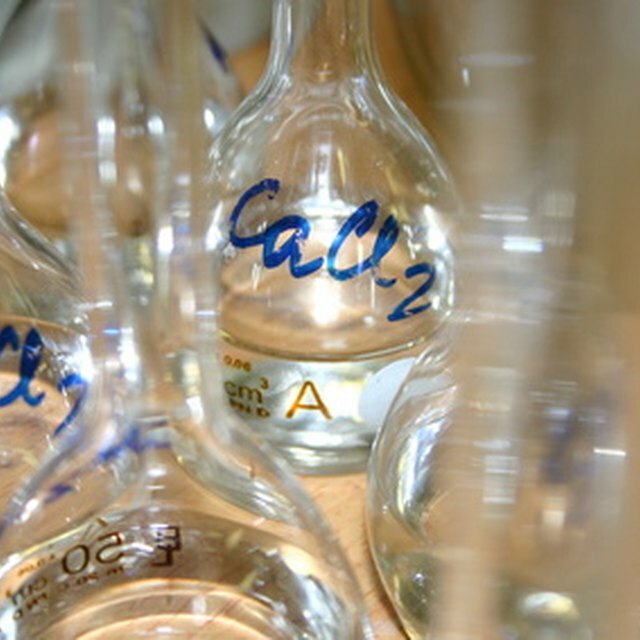 Most flasks and beakers are made of glass, but specialized uses sometimes suggest using other materials. Borosilicate glass resists damage from chemicals and heat. Plastics, while not as resistant to most chemicals or heat, provides a cheaper disposable option to glassware, especially when a large number of flasks are required. Teflon, a polymer material resistant to all but a few chemicals, may be necessary for certain experiments. Beakers are the standard vessel used in chemistry. They come in all sizes including 5 milliliter (ml) flasks and flasks of many liters (L). Much like a cup or a mug, they consist of a cylinder, usually glass, with a flat bottom made to hold liquid. Beakers may or may not have a pour spout although they usually do. They also may or may not have markings on the side labeling the approximate volume they contain. They are not very precise in their measurement and are made to contain chemicals or reactions. If a beaker needs to be heated, a hot plate is ideal, but a Bunsen burner and beaker holder will also work. Although most types of beakers are made of glass, plastic beakers are also available. Erlenmeyer flasks are flat-bottomed flasks that are similar to beakers, except that the sides taper in as they go up and form a narrow vertical neck. They also typically have measurement markings and pour spouts. They are typically used when chemicals need to be heated because their tapered sides help keep some of the heat in that might otherwise be carried away by evaporating materials. They can be heated over a Bunsen burner or a hot plate. Round bottom or boiling flasks do not stand up on their own and must always be held by a clamp. They typically do not have markings (other than a mark approximating maximum volume) or pour spouts. They can be heated by Bunsen burner, or by a special type of hot plate that is made to accommodate the round bottom. Volumetric flasks are a very precisely made type of science flask. They are made to measure out extremely accurate volumes of liquid. They typically have a bulbous bottom that may or may not be flat, and a very long, very narrow neck. A marking on the neck is there for measurement. When the meniscus of the liquid in the flask is level with this mark, a precise volume has been measured. The flask will also be labeled with the error margin for the measurement. These flasks may change volume if subjected to high heat, so must be air-dried and should not be heated. Filtering flasks are shaped much like an Erlenmeyer flask with a short side tube. These flasks are used with a Buchner funnel (a ceramic funnel) and a vacuum pump system. The vacuum pump is attached to the side tube in the flask. Filter paper is fitted into the Buchner funnel and the material to be filtered added to the funnel. As the vacuum pump creates a low-pressure system in the flask, liquid is drawn through the filter paper into the flask. Distillation flasks, also called fractional distillation or fractioning flasks, resemble round bottom flasks with a long side arm or tube projecting from the neck of the flask. These flasks are used to separate fluids based on their boiling and condensation temperatures. Burdick, Rebecca. "The Names of Chemistry Flasks." Sciencing, https://sciencing.com/names-chemistry-flasks-5914299.html. 12 October 2018.